Who does not know Udjo Ngalagena (born 5 March 1929), the figure of the great artists who upload their work will always be remembered for all time. Mr. Udjo love of art and culture since he was child by studying the angklung, traditional martial arts (pencak silat), gamelan and folk songs in the form of kawih and song. But in the course of his life until the end of his life on May 3, 2001, he was better known Because angklung, a traditional music instrument of West Java. Saung Angklung Udjo located at Padasuka street no.118, Bandung, initiated and established in 1966. The existence of Saung Angklung Udjo is growing due to the commitment to love Mr. Udjo against traditional culture and art as well as the desire to create a work that is good and useful. 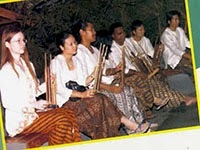 In 1971 the Office of the Department of Tourism pointed Saung Angklung Udjo as one of the City Tourism Project. According to one of the successors pack Udjo, (his son) Saung Angklung Udjo is not only presenting performances and children’s dances are always held each Monday-Sunday hours 15:30 – 17.30WIB. But supported by the souvenir shop that provides a wide range of goods and handicrafts. Also available is the education for children of school age children who want to learn the material angklung How to make and how to play the angklung. 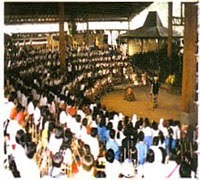 Udjo Ngalagena never aspired to make Saung Angklung Udjo become what it is today. But along with the progress and development of Saung Angklung Udjo, he has one hope that people in the country love and appreciate the art of traditional culture that we have, not to the art of our culture is becoming more well-known abroad. Japanese Cave – Travel Destinations. Tangkuban Perahu Mountain – Travel Destinations.